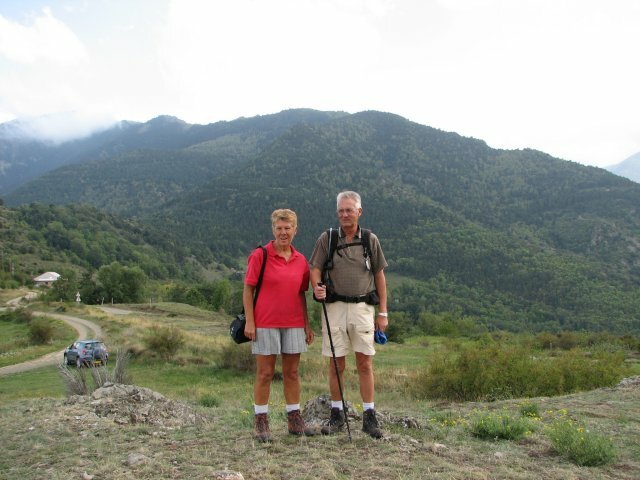 Here are the two people that are responsible for three WONDERFUL holidays in the French Pyrenees. They are called Brenda and Mannes. 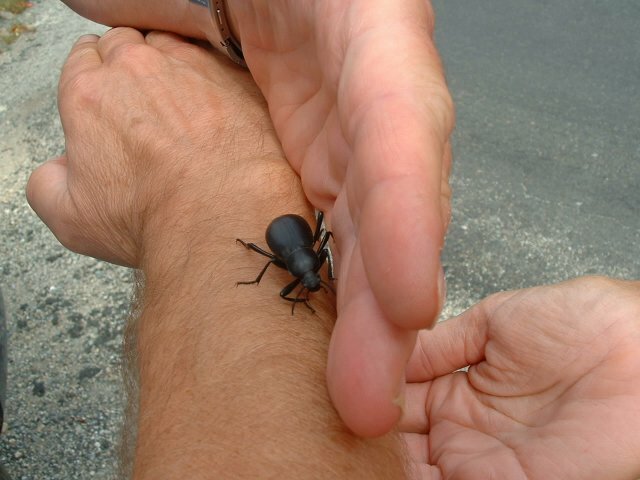 We first met them by chance when we all slept in the same gite one night while Colin & I were in the Basque region. It was just them, my brother Colin & I. 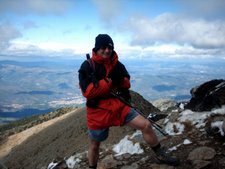 This chance meeting led to an invitation to visit them after they had done the little walk they were on - the EIGHT HUNDRED kilometre GR10. Oh, and just to make it that bit more interesting, they were doing it with two dogs. I can't begin to express how grateful I am for the ensuing holidays - they have showed us the best, the most incredible, the secret, and the special places around where they live. Mannes lives in Vernet le Bains, and Brenda lives in a small village called Nyer, about an hour south west of Perpignan. Nothing is too much trouble for them, and they will go to any lengths to make sure their guests have the best time. Believe me - they never fail! So - thanks to them both as, without them, most of this would not have been possible, and I doubt we would ever have visited this stunning part of France. With four days holiday remaining this year, I decided to blow the lot on a trip to France. I've always been in spring before, so wanted to see it in a different season. Usually, when I go, I eat fresh cherries straight from the tree off the patio outside 'my' bedroom at Brenda's house. This time it was ripe figs, pomegranates and walnuts! Walking on the hillsides and mountains in France is a sensory feast, as the smells are divine! The fresh herbs get crushed as you walk, and the aroma wafts along with you. Of course, there are the flowers too. Anyway - the journey began with Brenda taking a TWO HOUR drive to Carcassonne to pick us up from the airport. 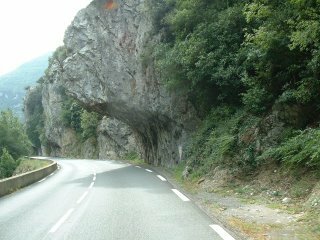 Typical of Brenda, she decided not to take the motorway back, but to go through the 'Gorges de St George', as it was prettier! 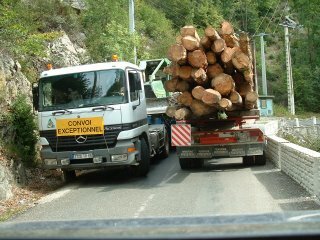 It was also quite spectacular (and S-L-O-W, as we got behind one of the many log lorries on the way.) HOW these monsters negociate the gorges is a mystery. They often take up all of the available road, often forcing cars to reverse to allow them to continue. Here's a big truck going through one of the small tunnels. But it made me ponder - what DO they do when they get to an overhang like this? The answer is, they just move right across to the left - and they just get by. NOT a job for the feint-hearted! 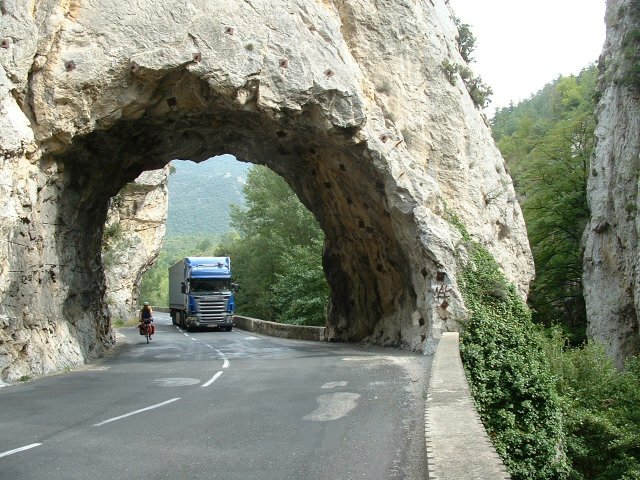 Sometimes, inevitably, two big lorries meet. These two leaned out and shook each others hand as they inched past each other. When this happened in front of us, I really didn't think they'd get past each other, but they are used to these tight squeezes and take it all in their stride. Wonderful photographs, wonderful description of your holiday. I repeat what I always say to you, you're wasted! (In the nicest possible way of course).